"Eleven o'clock in Grover's Corners. Everyone's resting in Grover's Corners. Tomorrow's gonna be another day. You get a good night's rest, too." We've all probably suffered through and/or participated in our fair share of productions of Our Town, Thornton Wilder's warhorse of a play, and it's not difficult to see why its popularity endures: it can be produced with little or no expense, and it's easy to shellac over a lot of it, and think of it merely as a Hallmarky valentine to the virtues of small-town life. It also provides perfect roles for the high school quarterback and the captain of the cheerleaders, and can send everybody out of the theater feeling as if they've seen or participated in something life-affirming. That saccharine assessment does Wilder a serious disservice, though; it's what you might think of the play if you tuned out after the first intermission, and didn't even bother to pay particular attention to Act One. Wilder's output as a dramatist wasn't prodigious; as major works for the stage go, there's really only this, The Matchmaker and The Skin of Our Teeth. But Our Town alone would put him in the pantheon, if a notch below O'Neill, Williams, and Miller; it really is a dark, dark play, the principal topic of which is the obliviousness with which most of us live our lives most of the time. The central conceit of the piece is that it plays without props or scenery; it's the job of the actors to conjure those up for us, which can mean either that the cast is incredibly persuasive, or that nobody had any time or money to spend on production costs. Welcome to Grover's Corners, New Hampshire, at the turn of the last century—Wilder's play had the veneer of nostalgia even when it was first produced, in 1938. We follow the lives of the families Webb and Gibbs; they are next-door neighbors and lifelong acquaintances, as are just about all of the inhabitants of Grover's Corners. Presiding is a mythical, Godlike figure, never referred to by name by the other actors, known in the text only as the Stage Manager; here the part is taken by one of the towering actors of recent decades, Paul Newman, and it's this bit of casting that may have been the catalyst for the production. 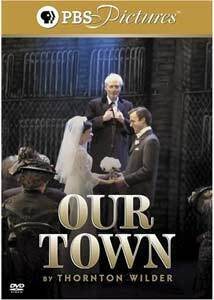 (This incarnation of Our Town was first produced by the Westport Playhouse, whose artistic director is—surprise!—Joanne Woodward; it subsequently transferred to Broadway, where it was filmed for television.) Seeing Newman in this role is a reminder that he's not just a great big movie star, and was for decades more than a very pretty face; he's of the same generation as Brando, and if he isn't as revered in acting circles, it may be because of the thoroughly professional, workmanlike way in which he approaches his craft. At first it's hard not to gasp, just looking at him in this role: my God, it's Butch Cassidy, it's Fast Eddie Felson in Our Town! But not only does he demonstrate a high level of skill, as you might expect; he seems to be having a good old time with the role, as well, especially when he gets to drop into the story and have some fun in character as, more or less, a series of old coots. James Naughton directed both the Broadway production and this filmed version, and he hasn't quite found the right visual style; instead of talking to the audience (for there is none here), the actors frequently speak directly to the camera, but in only a half-hearted, semi-Brechtian sort of way. Early on, too, Naughton uses lots of dolly shots and overcuts, presumably as a reminder that this is sort of a movie; it doesn't add any storytelling value, and actually ends up being a little nauseous. It's easy to forgive, though, because the director has gotten some fine work from not only Newman, but from the rest of the cast—I bet every production of the play you've seen descends into the can't-get-theah-from-heah parodistic version of the New England cadence, making it into a drama about castoffs from a Pepperidge Farm commercial. Maggie Lacey and Ben Fox are fine as Emily and George; he's especially good in the fumbling aspects of courtship ("I always thought of you as one of the chief people I thought about"), and her third-act epiphany is beautiful in the moment, though her goodbye speech isn't as affecting as her rueful participation in her own memories. Also especially noteworthy are Jane Curtin and Jeffrey De Munn as Emily's parents; they're especially good at showing how these characters are embarrassed by the very idea of feelings, and mortified by the prospect of being asked for advice. Naughton's production has the good sense to know that a small town like Grover's Corners likes to keep its own counsel, and gives up its secrets only slowly. In the previous Broadway production, the late Spaulding Gray made for a haunting Stage Manager; it was a dark look at Grover's Corners, the sunlight of the first two acts eclipsed almost entirely by the third. Newman's star quality may initially upset the balance, but it's clear that he's here not because it's a vanity project for him, but because he's a solid actor doing fine work in a great American play. You get a good rest too. Image Transfer Review: A pretty fair transfer; it's shot largely in darkness, and of course, given the circumstances of the production, has a stagy feel. Audio Transfer Review: Good balance, some hiss; it's all clear enough, with surprisingly good dynamics for a taped live performance. Extras Review: The only extra of note is the text of an interview with Newman, Naughton, and Joanne Woodward, on the impetus behind the production; Woodward talks about producing the play in a post-9/11 environment, seeing it as a necessary examination of our national character. A most convincing incarnation of one of the most enduring American plays; it's in that funny gray area between theater and film, which makes for occasionally uneasy going, but a gentle, expansive performance by Paul Newman helps to salve many of those wounds.